The Seabrook Sailing Club was founded by four men in 1934 as a means to enjoy sailing with friends on Galveston Bay. That philosophy continues today and is reflected in the club’s objective: to encourage and promote good fellowship, sportsmanship, and racing of small yachts. One of the founding members, Earl Gerloff, was an active member in the club from its beginning until he sadly passed away in 2012. Earl earned the rank of Commodore Emeritus for his many years of service to the club, and he reflected the spirit in which the club was founded and in which it currently operates. He is one of the reasons the club has survived to this day. Boats cover the lawn at the Seabrook Sailing Club during a junior sailing regatta. Photo by Loretta Mulenburg. The Seabrook Sailing club was originally located on Galveston Bay along the Kemah waterfront. In 1950, the club purchased the property at 1020 Todville Road in Seabrook, where it remains today despite Mother Nature’s occasional attempts to remove it. The clubhouse was rebuilt after hurricane Carla in 1962. The grounds and buildings were significantly damaged by hurricane Alicia in 1983, by hurricane Jerry in 1989, and by tropical storm Francis in 1998. Hurricane Ike destroyed the clubhouse in 2008 and the new clubhouse was recently completed. After each storm, strong efforts by dedicated club members helped get the club repaired and back to normal. The club has always maintained a high profile racing schedule. Races are held from March to November. Weekend club racing is organized into Spring and Fall Series, with sailors racing every two to three Saturdays. 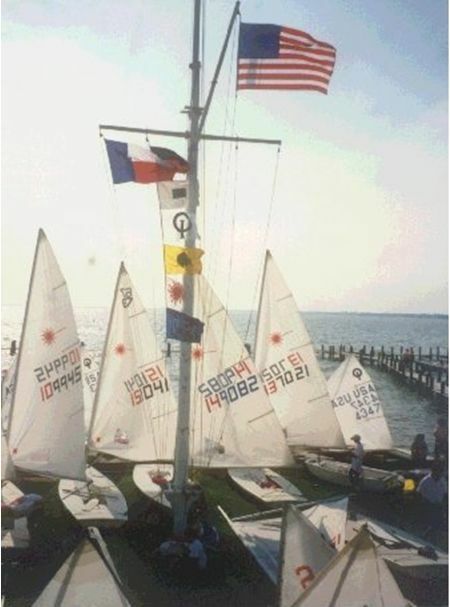 SSC also organizes and hosts a number of open annual regattas, and hosts regional and national regattas that are well attended in part due to Galveston Bay’s warm waters and consistent breezes. SSC runs an excellent Junior Sailing Program that is heavily attended by member’s children. The program is structured around “sail and learn” sessions in which kids get hands-on sailing experience under supervision of an instructor along with parent and teenage helpers on many Saturday mornings throughout the summer. The program is designed to accommodate children with a wide range of sailing abilities. The main goal of the program is to teach kids to sail and be completely comfortable on the water. The club has six Optimist Prams for children to learn to sail in and enjoy. One secret to the Seabrook Sailing Club’s success and longevity is the niche it has carved for itself in the Galveston Bay sailing community. SSC is a family-oriented sailing club that places a strong emphasis on small boat racing. It is a do-it-yourself club where members participate in organizing club events and maintaining the facilities. By having all members serve on one of several committees and by having everyone pitch in at work parties, the club keeps the cost of membership low and the quality of its facilities high.